the nytpicker: Whoops! In Today's Jackie Chan Wedding Announcement, NYT Offers Hyperlink To Actor Jackie Chan. Whoops! In Today's Jackie Chan Wedding Announcement, NYT Offers Hyperlink To Actor Jackie Chan. In today's NYT wedding announcement of investment banker Jackie Chan to his new bride, Kaibin Hu, a management associate at Estee Lauder, the NYT appears to have mistaken the groom for another Jackie Chan. 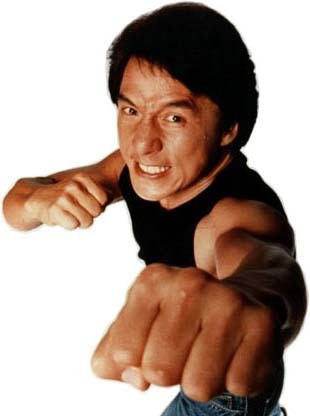 In the announcement, a hyperlink on Chan's name takes readers to a "Times Topics" page for the legendary Hong Kong actor Jackie Chan -- who, presumably, isn't moonlighting at Greenhill & Co., the New York City investment bank, as he awaits the 2011 release of "Kung Fu Panda 2." Still there at 9:19 p.m. Possibly could be an automatic link. I.e., they have a database of names that get auto-linked, and woe unto those whose names are also held by famous people. I happen to know how this system works, and it is automated. These kinds of mistakes happen fairly infrequently because they usually show up on pages where there is some context to the reference -- like Jackie Chan in the movies section would be a lot less ambiguous. Why they have this system on on weddings is beyond me, though. A few weeks ago, a San Francisco story included a waitress named Rachel Corrie. The Times gave the name a link, and of course it went to to the woman who was killed by an Israeli bulldozer. I found the smoking gun. The Korean police in cahoots with the Korean media set this story up for two years running so far, google it, it's all there, clear as day, and the Korean police refuse to release the official records of her, er, um, alleged 960 tests.... NOT TRUE. END OF STORY. READERS OF THE NEW YORK TIMES GOT PUNKED BY SLOPPY EDITING. Maybe it's the Times editors fault to make the story too 'feel-good.' They were trying to explain why South Koreans in general were so fascinated by her story? sections and the entire blogosphere lit up. times? Does it matter? YES IT DOES. Why? i love, i always have loved the NYTIMES. the original story and report back to me ?